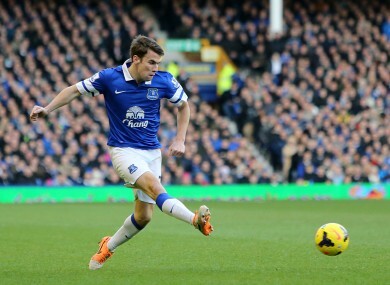 Everton's Seamus Coleman is currently the fifth highest-scoring Fantasy Football player. AS PRETTY MUCH every Ireland supporter has been saying over the past few weeks, Seamus Coleman is quite good at this football thing. Don’t believe me? Well then check out his Fantasy Football stats, which is obviously the only rational way of measuring a footballer’s performance. Coleman, despite being a defender, has 118 points — 19 more points higher than his nearest challenger (Per Meresacker), while outscoring most midfielders and strikers as well (he is the fifth highest-scoring player in the entire game). So there you have it — Seamus Coleman is definitively the greatest thing since sliced bread, the Irish Cafu, the Donegal Denis Irwin, the SOLE reason for Everton’s success. Consequently, we normally pursue a policy of picking only cheap defenders, but we’re willing to make an exception for the Everton full-back. And so needless to say, I have him in my team and so should you. Hell, while we’re feeling patriotic, why not just fill the entire side with Irish players in celebration? There seems to be a fair few of them floating about in the Premier League these days. Elsewhere in the team, our policy of forgetting to change/keeping faith with Aaron Ramsey is about to pay off, with the midfielder set to return from injury soon. Ditto, Ross Barkley, who at £5.2million, represents a better bargain than anything you’d find in the post-Christmas sales. Finally, some advice: United are playing Chelsea this week, so don’t forget to take Rio Ferdinand out of your teams, if — for some bizarre reason — you’re one of the 2.1% of players who still have him in there. Your crafty Fantasy Football-playing, Seamus Coleman-loving canine. Email “Diary of a Fantasy Gaffer: Get Seamus Coleman in your teams pronto ”. Feedback on “Diary of a Fantasy Gaffer: Get Seamus Coleman in your teams pronto ”.